File sharing refers to the practice of transmitting data and files such as texts, graphics, music, video, and images from one computer to another computer via a network or over the Internet. This can be done in two main ways namely: the peer-to-peer method which entails the transmission of data from one computer to another via a network and the file sync and file sharing devices which entail the transmission of data through websites, applications, Bluetooth connectivity and indeed so much more. File sharing makes the task of accessing the desired piece of information easy, convenient, and instantaneous. This reduces the amount of effort, time, and energy which is in turn deployed to the performance of other organizational tasks. Since the organizations are not required to own the infrastructure that store, share and maintain the files, the amounts of money that would have otherwise been used to put up and maintain this infrastructure rendered null and void. The organization's operational expenses are therefore reduced. File sharing reduces the amount of time that would have otherwise been used to search and retrieve the required information manually. This time can be further used to undertake other tasks that equally matter insofar as the fulfillment of the corporate objectives are concerned. The adoption of this technique reduces the amount of storage space that an organization is required to put in place in order to accommodate the number of files it requires. This comes along with various benefits among them being the need for less office space, reduced costs of doing business, and the reduction of other overhead expenses. 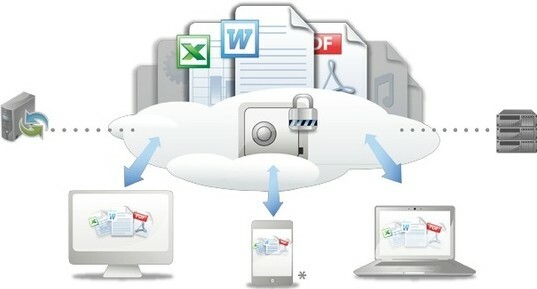 The access of files via a file sharing infrastructure, and especially when all the necessary security precautions are taken, improves the integrity of the data so obtained due to the fact that such data is less prone to loss, manipulations, and other forms of interferences that may hamper its accuracy and reliability. Therefore, any subsequent decisions, interpretations, and conclusions derived from them are more dependable. File sharing predisposes the company documents and data to security breaches. This could be in the forms of unauthorized access (hacking), worms, viruses, and phishing e.t.c. In the unfortunate event of this situation, the confidence that the clients of the organization had on the data are dealt a severe blow, which in turn also affects the integrity of the organization as a whole. It is the practice of taking up other people's unique ideas and making them one's own. This brings about lots of problems which include but not limited to revenue loss accruing from the sales of the materials that have been plagiarized, penalties from relevant statutory authorities to those apprehended, and diminished confidence in the organization as a whole by its clientele. Sharing of files leads to the increase loss of the privacy of individuals or companies because it makes it possible for sensitive information regarding the company to be easily accessible by third parties. These pieces of information may later be used against the organization. It is important to note that the benefits and risks of file sharing as outlined above are by no means exhaustive since quite a number could not be discussed due to space constraints. In order to leverage on these benefits and to effectively guard against the potential risks, it is necessary to outsource the services of a competent, professional and experienced online video conferencing provider.